248 in stock Need More ? Everyone's favourite wimpy kid is back for his eighth appearance in Jeff Kinney's world-famous series. 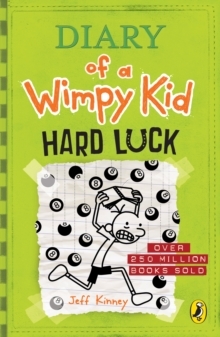 Get stuck in to Diary of a Wimpy Kid: Hard Luck to find out what scrapes Greg Heffley has gotten himself into this time! Mom's always saying that friends will come and go but family is forever. Well, if that's true, I could be in for a rough ride. Greg Heffley's on a losing streak. His best friend, Rowley Jefferson, has ditched him, and finding new friends in middle school is proving to be a tough task. Will a roll of the dice turn things around, or is Greg's life destined to be just another hard-luck story?Perfect for readers of 7+, including those more reluctant readers. Don't forget to catch Greg on the big screen in the three movie box office hits (after you've finished the books of course! ).